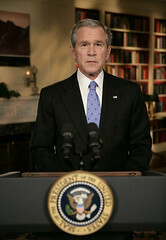 If you are a religious person who does things others might find objectionable (not to mention illegal), like discriminate against people of other faiths in your hiring practices, President Bush says it's not fair to force you to give up your identity in order to compete for government handouts grants. On the other hand, if you are a woman of reproductive age who does things others might find objectionable, like make a medical decision to terminate a pregnancy, it's not only fair to force you to give up your identity but your bodily integrity, and the right to be considered competent to give consent, as well in order to be permitted to receive medical care. Because there's Sky Fairy believer fairness, and then there's female patient fairness.